Calms, balances and fortifies with extracts of St. John's Wort and hops. Features a comforting light, sweet almond fragrance. 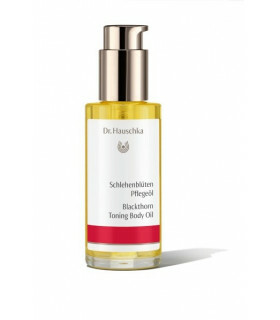 Dr. Hauschka's Birch Arnica Energising Body Oil soothes, revitalizes and supports flexability for tight muscles and fatigued joints. Extracts of blackthorn, birch leaf and St. John's Wort strengthen, providing warmth and protection while supporting elasticity. Helps minimise the appearance of stretch marks due to weight loss or gain. Awaken your body and mind with vitalising everyday body care. Lemon Lemongrass Vitalising Body Oil fortifies and firms the skin while the uplifting, refreshing scent of lemon extracts invigorates. Lavender essential oil and moor (peat moss) extract provide comfort, protection and a sense of well-being. Horse chestnut extract firms, tones and reduces the appearance of varicose veins. Damask rose extract and essential oil balance and harmonize, soothing and calming irritated skin while helping to soothe the senses. Awaken your body and mind with vitalising everyday body care. Lemon Lemongrass Vitalising Body Oil fortifies and firms the skin while the uplifting, refreshing scent of lemon peel and lemongrass extracts invigorates the body and mind, making it the perfect prodcut to wake you up each morning.